Intel rang in 2011 with its second-generation Core processors, promising vastly superior performance, better graphics capabilities, and improved energy efficiency. How much of a difference can a new CPU generation really make? If our tests of the first systems to use these revamped CPUs are any indication, the answer is "quite a lot." The new processors--formerly code-named Sandy Bridge--deliver stronger performance than their predecessors did, and at palatable prices. Intel's integrated graphics have come a long way, too, with support for 3D Blu-ray and smooth playback of 1080p content. But video game fans shouldn't toss out their discrete graphics cards just yet--the graphics processors built into the new CPUs stumble on many modern titles. Bad news for upgraders, too: Intel has reworked the socket for the platform, so if you're looking to upgrade aging hardware, you must also factor a motherboard purchase into your budget. The second-gen Core launch was not without hiccups. In late January Intel issued a recall of Sandy Bridge's 6 Series chipset due to a design flaw. According to Intel, this flaw in the motherboard chipset would cause performance of the SATA ports to degrade eventually. Despite those concerns, Intel's new hardware remains a force to be reckoned with. If you're considering a new desktop or laptop with an Intel processor, chances are good that it'll be a Sandy Bridge model. We'll help you understand the strengths and weaknesses. The new CPUs retain the Core i3, Core i5, and Core i7 monikers that Intel has used for a few years, but the naming scheme is a bit misleading: These processors have a whole new architecture, and aren't simply a revision. The company optimized and enlarged the caches for "micro-ops" used in the CPU, allowing for more-efficient, faster handling of tasks. Performance for AES encryption and SHA-1 hash operations is improved. A new set of vector extensions (called AVX) promises to rev up performance in some data-intensive applications, once they have been optimized to use the new instructions. And a new ring bus enables faster communications between cores and the integrated graphics processor. Intel has made technical changes within the CPU cores, as well, most of which are of interest only to coders and compiler developers. What you need to know as a consumer is this: Performance should be better in just about any application that relies heavily on the CPU. PCWorld Labs results showed considerable performance gains when comparing Sandy Bridge systems with first-gen Core PCs that are only a few months old. For instance, we saw a 13 percent increase in performance between a system with the new Intel Core i5-2500K and a similarly equipped six-month old PC sporting Intel's first-gen Core i5-650. The divide widens when vendors overclock the CPU. An $850 desktop with an overclocked Core i5-2500K cruised through tests 20 percent faster than a $2000 PC with an overclocked Core i5-655K. Our initial testing demonstrates that the new Core processors allow users to do quite a bit more for less, and performance will only get better as tools and libraries are updated to allow applications to make better use of the features. Enhancements to Intel's Turbo Boost technology will let the new Core CPUs run at higher clock speeds more often. The automatic speed-boosting feature used to work only if one or two of the cores were active while the others were idle. Now, if conditions are right, it can operate even when all cores are busy, and it can also boost the speed of the graphics processor a bit, if necessary. If you were disappointed with the integrated graphics and video performance of past Intel processors, you'll be thrilled to know that this is probably the most improved aspect of the new chips. High-definition video plays well, and the 3D graphics are fast enough for modest games. With the previous Core i3, i5, and i7 processors, Intel incorporated integrated graphics directly into the CPU package. It was technically a separate chip on a different piece of silicon, and the results left us unimpressed: High-def video often stuttered, and PC gaming was pretty much a lost cause. With Sandy Bridge, Intel has incorporated the graphics processing unit onto the same silicon as the CPU cores. The GPU communicates with the CPU cores along the high-speed ring bus and shares the L3 cache with the CPU cores. This GPU is compatible with Microsoft's DirectX 10.1; it is also dramatically faster than previous Intel integrated graphics. And as noted, the GPU can take advantage of Turbo Boost, giving you a little extra graphics kick right when you need it most. All of the laptop versions of the new chips have a graphics processor with 12 execution units, while some of the desktop versions will use a cut-back version with 6 execution units and others will have the full 12. Unfortunately, you have no immediately obvious way to distinguish the two, but don't worry: The processors with fewer execution units are meant for either very low-cost systems or high-performance systems that will use a dedicated graphics card and circumvent the integrated graphics entirely. Performance of the new graphics chips is impressive compared with what we've seen from Intel, but it's still not good enough to please seasoned gamers. For example, you can play modern titles such as Starcraft II smoothly, provided that you don't turn the resolution up too much or enable the highest graphics settings. Any gamer will want to pair their new Intel CPU with a good Nvidia or AMD graphics card. Still, the ability to handle such games at all is a big step forward for Intel. GPU-accelerated features in upcoming Web browsers (such as Firefox 4 and Internet Explorer 9) work, too, resulting in smoother and more fluid Web browsing on cutting-edge sites. Video processing is significantly improved with the new CPU, which offers better decoding of the MPEG-2, MPEG-4, and VC1 video codecs and fully supports 1080p Blu-ray playback (even 3D Blu-ray movies) at smooth frame rates. This enhanced video decoding, along with the improvements to the CPU cores, makes for superior performance in converting files from one video format to another. In our testing, we converted a 10-minute-long video clip into various formats on a wide variety of PCs. The revamped integrated graphics consistently finished the task at rates between 50 percent and 70 percent faster than the older Core processor; the new chip's results were also just a few seconds behind those of a $300 graphics card. All eyes are on energy efficiency these days, and the trend has not escaped Intel's notice. Despite the remarkable performance of the new processors, they tend to sip less power than the older CPUs do. In desktop PCs and all-in-ones, that translates to cooler and quieter systems and a slightly lower power bill; in laptops, it means longer battery life. How much power a PC consumes depends on everything from the power supply to the key components to the brightness and efficiency of the display. It's therefore hard to draw direct comparisons. Still, our initial lab results are promising. When we compared PCs based on their WorldBench 6 scores, those with older Core CPUs used 57 percent more energy than our Sandy Bridge test platforms did to achieve the same results. How do you know whether you're getting one of the new processors? Look to the model number: The new CPUs are still called Core i3, Core i5, and Core i7, but those names are followed by four digits starting with a "2." A Core i7-2600K is new, for example, while a Core i7-970 is older. The quad-core models came out first, and the dual-core versions are arriving now; the latter should be less expensive and require less power, which means they'll fit into smaller and more-affordable laptops and desktops. Want to learn more about the performance benefits of the second-gen Core chips? 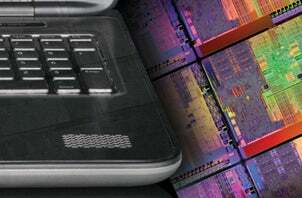 See how these six Sandy Bridge-based systems did in PCWorld Labs tests.